Fed-up with imitation leather and weekend bags that just make it easy to travel with an iPad? Step forward the Weekender, the fruit of a partnership between Dom Reilly and The Financial Times to create luxury travel accessories. 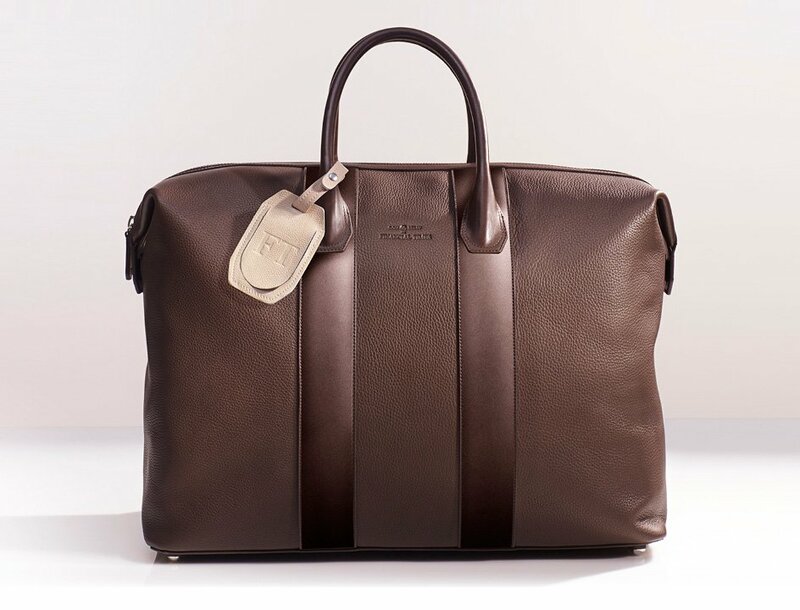 Naturally, Weekender arrives wrapped in a rather large drawstring bag, which instantly lends a high-end feel to the product, though it is rather pointless. The Weekender doesn’t need much help in appearing top end luggage; the soft leather finish and simple design takes care of that. The Weekender is not particularly small. Measuring 56x24x37cm and weighing the2.3kg when empty, it looks every bit a travel classic. The hull i leather-covered hardboard with five metallic stoppers, which prevent it from both losing shape, and from ever touching the floor. Two classic grab handles on the top are sturdy while being held. Kudos, too, for the large zipper, which is tough but slides across the top easily, easing the corners up as it opens. On the soft inside of the Weekender is one huge section for clothes, flanked by two side pockets. One of those pockets is a simple slipcase is ideally sized for sliding an iPad into. We tested the Weekender with an iPad 4, which fitted very snugly indeed. In fact, if you are using any kind of cover on an iPad – and particularly something like the Logitech Ultrathin Keyboard for iPad – it’s not going to fit. That’s the price you pay for protection. Happily, there are options. On the other side is a zipped pocket that’s identically sized, so you could store iPad covers and accessories here. It’s also an ideal pocket to store cables, chargers, and USB sticks, etc. The main area is huge, and easily big enough to hold a few changes of clothes, a pair of shoes and a coat. You could easily get a 15-inch laptop in there, too, though it would have to sit loose. The range also includes a laptop case, iPad case (both with high-density foam lining used in the cockpits of Formula One cars) and a travel wallet, with prices starting from £195. The Weekender is less about protection and more about classic styling, but it meets its brief. A short-trip bag for throwing in the back of a car or taxi rather for carrying around an airport, the Weekender is expensive, but a cut above if you’re on the lookout for a classic design with a modern iPad touch.